or repair and restore your neon beer or other neon sign. slows the process down and increases your shipping cost. but they can be used for any indoor neon sign. I also carry small core & coil transformers. I stock glass housings too. What you see is what I have, I can't special order. the neon supplies you need. If you want only supplies there is a $7.50 minimum. As always I will charge actual shipping on these items. can ship in a priority bag for $7. Email me your list and I will send you an invoice. but if you need mixed parts email first. New neon tube stand off / tube support / mount, all clear color. 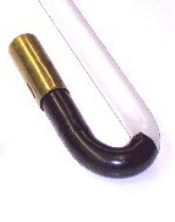 These are tie down style, extra wide to handle any size neon glass tube. Clear off set tube mount for those hard to mount places. These are 1 3/4" tall. Clear plastic neon tube support or glass holder. Snaps on and needs no tie wire. 2" tall, fits many sizes of glass. 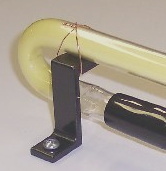 Glass neon tube support or mount with nickel plated brass base. This is the classic / vintage style support used on porcelain neon signs. 2" tall with tie wire already on each one. Unless noted all the boots below fit 12/13mm electrodes. wire to lay next to the tube, reverse style. Small tapered wire to neon tube boot or short stop, 13mm. OEM on some older beer signs. Glass neon tube to neon tube sleeve. These are new (NOS), the rubber boots still have talc on them. Neon tube to neon tube sleeve. A thick heavy duty one. This one is for the usual size neon beer sign tube. Do you have a neon tube electrode with the wires broken off ? This cap can cure your problem. They are for 15mm electrodes, you need to adapt them to smaller ones. Large shrink tube, fits over neon wire sleeves and boots. Copper neon tube mount tie down wire. Plastic neon tube mount tie down kit. For Busch mountain and other signs using this system for border mounting. One kit has 6 plastic "wires" & 6 metal crimps. Note the cork pads pictured are not included (sorry but they are all gone). Transformer feet. These replace the rubber feet on the heavy coil type trans. You get 4 in a set. GTO high voltage wire for neon signs. I have high quality name brand Paige "Tuf-Hide" wire, not cheap import crapola. around for your future projects. WHITE SILICONE GTO high voltage wire for neon signs, off the roll cut to length. Same quality brand as above, Paige "Tuf Hide 15,000 volt, 14ga. Great for indoor neon instillations where wire is exposed and the white wire blends in better. I have new shipping on power supplies. $1 for each additional transformer! 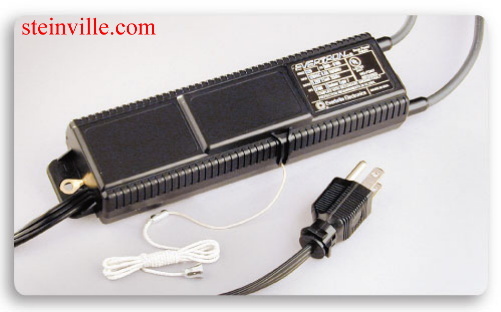 CPI advanced "universal" neon sign transformer / power supply. This will run any sign requiring up to 6,000 volts (35ma). Check your sign to see. Complies with Secondary Ground Fault UL 2161. Self Adjusting to neon load. Auto Shutdown & Overload Protection. 6' grounded cord. Features on/off pull-chain. This will run any sign requiring up to 10,000 volts (35ma). This will run any sign requiring up to 12,000 volts (42ma). (US price only, foreign shipping will cost more). for many neon beer signs. using the EH-1220 (below) to replace your EH-1210. Enhance EH-1220 neon transformer /power supply. 3500 volt, 8ma output core and coil neon sign transformer, 120v input. These are used in large neon clocks and other neon advertising signs. Can be used for any neon project. I have also sold these for ozone machines and bug zappers. These are 2" thick at the coils. Designed to run 6' of clear glass red neon or 8' of color in 10mm dia. Will run more length in larger diameter glass. 5000 volt, 8ma output core and coil neon sign transformer, 120v input. These are 2.5" thick at the coils. Designed to run 7' of clear glass red neon or 11' of color in 10mm dia. 6000 volt, 20ma output core and coil neon sign transformer, 120v input. Good for large Cleveland / Aztec type clocks with 2 rings (measure your glass). These are 3.5" thick at the coils. Designed to run 11' of clear glass red neon or 14' of color in 10mm dia. Will run 14' of clear red neon or 17' of color in 12mm dia. These are original equip on many neon beer signs. I have new shipping on transformers. $2 for each additional transformer! This replaces the older Evertron models 1212 & 2612 (800-0128) . 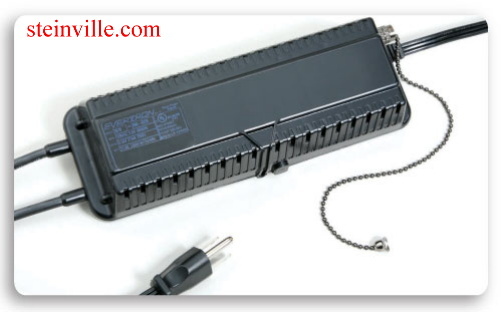 Has a plugin with 2 low voltage (20-22v) outputs . Evertron 226h IEC type plugin neon sign power supply. Same specs as the 226h above. Evertron 3610D IEC type plugin neon sign power supply. Same specs as the 3610D "dimmer" above. Evertron NuAux 800-0175 power supply for motion neon signs. longer leads which you can trim if needed. No need to buy a case, I will sell you just one or more. Your choice, mix or match. using flat rate packages for aprox $7. 4 3/8" overall length top to bolt end. 4 1/4" overall length top to bolt end. Like the GH200 but compact for limited spaces. 3 1/4" overall length top to bolt end. 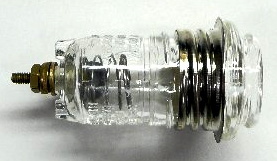 Small 6 inch / 4 watt fluorescent bulb. 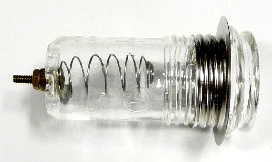 These are old stock Sylvania (USA made) F4T5/CW bulbs. beer sign transformer. Neon ballast, neon balast, neon power supply, beer sign power supply. Neon sign standoffs, neon mount, neon tube holder, neon tube tie down, neon sign parts, neon tube clips, neon tube clip, neon supplies. Tube supports, neon GTO wire, high voltage neon wire, HV wire, high voltage wire, neon wire, neon sign wire, transformer wire, tuf-hide gto, tuf-hide noodle flex, paige tuf-hide wire, paige 15,000v wire. core and coil transformer, core & coil transformer, core and coil power supply, neon core and coil, neon core & coil. 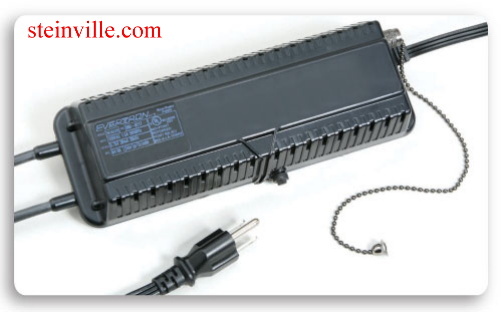 Neon clock transformer, neon clock power supply, neon clock ballast neon clock balast. tufhide neon wire, tufhide gto wire, paige tufhide, silicone gto wire, white silicone gto wire, gto-15, gto-15 wire, neon gto-15 wire. neon transformer wire. Neon parts supplier, neon parts supply. Neon insulators, neon rubber boot..
Everbrite transformer, everbrite neon power supply, evertron neon power supply, evertron transformer. Mount Vernon sign neon power supply, GHN neon sign power supply, fallon neon sign power supply. Evertron 226, evertron 3610, evertron 2610, evertron plugin transformer, evertron 2610 plug in. Evertron 224, evertron 226h, evertron 6,000v, evertron 10,000 volt, evertron MP10. Enhance transformer, enhance power supply, enhance neon transformer. 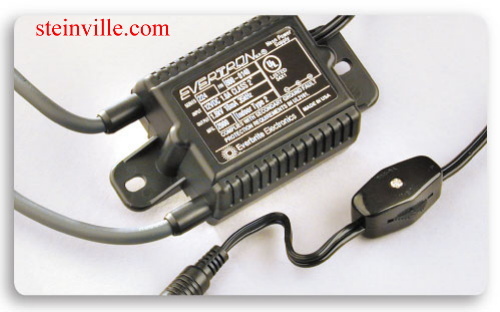 Evertron 3610D, everbrite neon transformer, everbrite neon sign power supply. 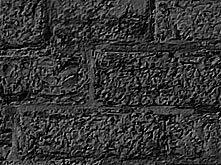 Enhance 1210, enhance 1220. Enhance neon power supply 1210, Enhance neon power supply EH-1220, Enhance neon ballast, enhance neon power supply Franceformer neon, franceformer transformer, franceformer power supply. France former neon. #100 glass housing, #200 glass housing, #200p glass housing, #300 glass housing, glass neon housing, pk housing, neon pk housing, neon Receptacle, federal bushing. Allanson standard neo lite, snl-ho-200, westrim gh-200p, wwg100. Electrode saver cap, neon electrode fix cap, electrode brass cap, brass electrode cover, electrode fixer.